I have the same problem for a couple of weeks now. Any news when this issue will be resolved. 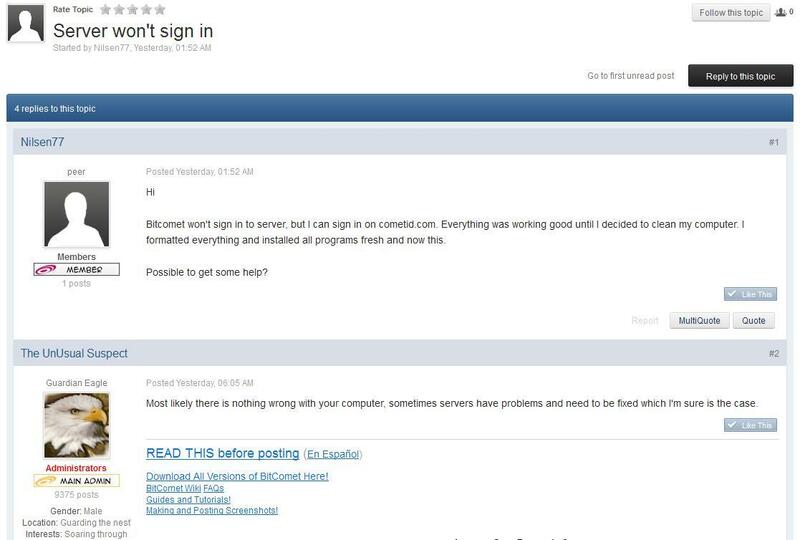 Unable to log in Bitcomet 1.40 more than 24 hours!!!! unable to sign in CometID at this time ??????????????? From Turkey same problem. Can't sign in CometId since 3 days? I was thinking because of my account change, but everywhere I see there is same problem. Same here, bro, me neither !! Reed this below and don't waste your Time with Replies in this Thread !!! Anybody can tell me why I can't login into my BitComet? It's happen in last 3 days till now. is the server down?? ?when will it be fixed??? Owh, I thought is only me. Maybe server down or something. Soon week as exists malfunction, and except the message on celebration of the Chinese New year and problems of operation of the server connected with it of any explanations and correction didn't follow. I want to congratulate developers of this software on their probably professional holiday - day of a condom! Same here, client can't sign in to server.